The first match at 3pm today was played between st. Paul’s High School Belgaum and St. Britto’s High School Mapusa Goa. It was a fast paced match though entertaining ended in a draw 1 – 1. Atif Mujawar took St. Paul’s in the lead at the 28th minute that was swiftly equalized by Lloyd Mascarenhas from St. Britto’s in the 31st minute. Both teams fought hard to win but ran out of time. 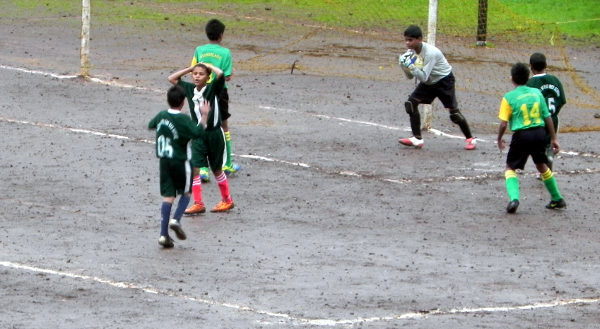 The second match started at 4:30 PM and was played between St. Stanislaus Mumbai and Islamiya High School Belgaum. Even though the match was slower paced, there was some excellent flashes of brilliance demonstrated by the young footballers. David Cason scored a goal in the 30th minute to take St. Stanislaus Mumbai in the lead which they retained till the end of the match. St. Stanislaus Mumbai won the match 1 – 0. Tomorrow, at 3PM, Don Bosco’s Goa take on St. Britto’s Goa and at 4 PM, Loyola’s Goa play St. Stanislaus Mumbai. Next articleBelgaum mein Auto ka meter August 1 se Down Hoga?